See Sarah Swatch: My favorite color! Happy Tuesday morning everyone! It's gorgeous outside over in Jersey and I'm so sad I'm stuck working till 5. Blah! I just want to lay outside all day haha. Anyway, I wasn't sure if today's TT post was supposed to be our favorite color to wear on our nails or just favorite color in general. So I went with favorite in general, yellow!, though none of my yellow polishes make any top 20 lists or anything. 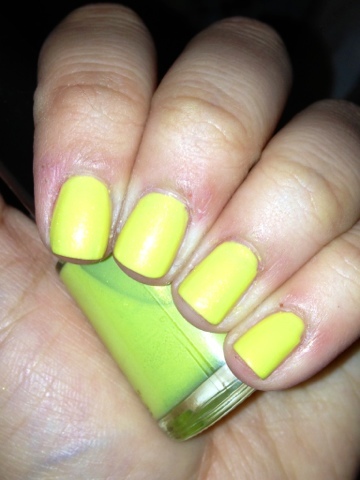 I find yellows just too hard to work with, so I'd rather wear yellow clothes than yellow nail polish! My prom dress was actually yellow, and so is my room. And for the longest time, I wanted a yellow car too:) So without further ado, I give to you the first yellow polish I found in my stash, Revlon Zealous (shown with 3 coats here). This isn't my favorite shade of yellow, but it'll do! This would be mine too! Wow, this colour is so intense--and I love that pretty shimmer! So pretty! Love that shimmer. I have been wanting to get Zealous for a while now. It's really pretty. nice yellow, love the shimmer! Love the shimmer in this one! Very pretty! Gorgeous yellow! Totally digging that shimmer! Great favorite! This is gorgeous!